Tadpoles is revolutionizing the childcare and preschool market by helping to streamline operations and parent communication through mobile technology. We work with childcare centers around the world to deliver mobile software solutions designed specifically to support student achievement and parental involvement. Tadpoles helps educators improve communications and engage parents in the learning process by sharing photos, videos, progress reports and other important information everyday. As a professional child care provider, I found this software extremely convenient and time-saving. Pros: What I like most about this software is the convenience of having all of my student information in one place, readily available at the literal touch of a fingertip. As a professional child care provider for over five years, I can't begin to tell you how much time, paper, and grief this software has saved. I love that each staff member and student's name has a photo listed right there with their name -- makes it so much easier on subs. And thing is, the whole program is so easy to navigate, most people would be able to learn the ins and outs within a few days use. One of my favorite features is the ability to share a photo or update with a parent in real time, and the fact that doing so only requires a few taps of the screen. While no product is ever going to be perfect, compared to similar software I've encountered, I'd go with Childcare by Tadpoles every time. Cons: While overall, my experience has been generally positive with this software, like anything else there have been some hiccups. My biggest complaint is that occasionally the software freezes when you're in the middle of updating a report or trying to perform some other (what should be a) relatively quick task. For some reason I run into this most frequently while using the in-app camera, though this problem has improved with each update. Another more rare issue occurred when, maybe once a month, a report would not get through to a parent or parents. I will say that for the most part during those issues, customer service was pretty much on top of it and able to help resolve the problem nearly immediately. Overall: This software provides me the greatest benefits in time-saving and general efficiency. Everything I need -- reports, student info, parent info, etc. -- is literally all in one place. I feel that because of this software and the efficiency boost it provides, not only is more time and energy focused on the students themselves, but that they're safer as a result. Constantly trying to shuffle around paperwork while teaching is no longer an issue! Plus, I didn't have to carry around a heavy binder anymore. Whew! Pros: I really liked the capability for parents to be able to see daily updated activities and lessons being done in the classroom. It was helpful to be able to plug in all the weekly lessons and have them ready to go, in case of a substitute teacher or just so parents know they upcoming themes and lessons. Cons: It took me much longer to understand this App over a couple others I have used as a teacher. I had to write in everything manually when this App was used at my former school which took a lot of time. To have lesson options, as in core standards and basic theme titles, would have made lesson planning much easier. Pros: Tadpole allows you to digitally input everything from your students day in the comfort of your own classroom. With something as small as a phone, you can download the app and input their whole day. Everything from diaper changes to feedings and parents absolutely love it. It completely changed how I organized my classroom. We never had any problems uploading anything, which was amazing. Cons: There are better softwares out on the market right now that allow you to do more with their app. More features so we stopped using Tadpole for this reason. Its a great beginner software, but we out grew it. You can't do as many admin features as other software inn the market. Overall: Tadpole is great to start usibg if you have never used a software in your classroom before. Definitely helps you stay more organized. Pros: I really liked using this software because it made my life as a teacher easier. I was able to communicate with the parents in real time and i didn't have to write anymore daily sheets or daily reports. The parents have also really liked being able to connect with us throughout the day. It's also very affordable which is great for schools! Cons: I think they could have found better and faster ways to put in information like what the child eats, when they go to the bathroom, etc. Overall: Overall i love this software it's been a huge help in my classroom and i would advise most childcare's to look into it. Pros: I love using this because it helps m feel connected in real time with my children and their school. If I am not getting photos, I am getting reminders about upcoming needs. Pros: As a parent, this app is very user friendly. I have multiple children and the organization of each of their updates and pictures makes it so easy to check in on their day. Cons: Every once in a while the app won't update for me right away when opening; occasionally getting stuck on a different day. Typically if I close it and open it up a little while later the issue resolves itself. 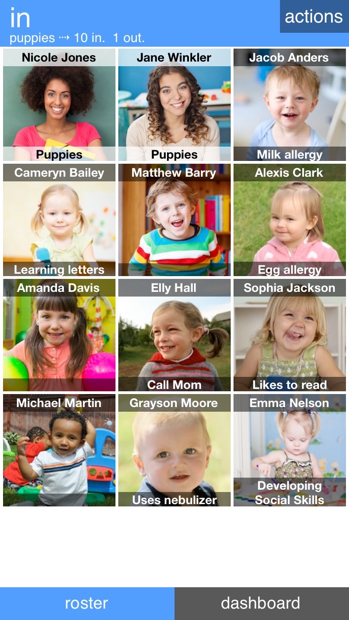 Overall: It's a great app for parents to keep abreast of their kids daily happenings. It's easy to use, easy to follow and makes saving the cute pictures from their day a breeze. Cons: Navigability is difficult, going from one day to another or from one month to another is complicated, downloading photos or videos is not always possible, having some kind of feedback to the teachers is not easy. Pros: Tadpoles is an excellent program that provides ongoing photos throughout the day as well a summary report so I know how my children handled their days. Cons: I have used similar programs that were tied into the center's finance program as well so you could view balances but Tadpoles does not offer this in my experience. Pros: Easy to write a more detailed note to all parents and get it to them quickly, without the hassle of handwriting/typing notes that will most likely get lost before the parent ever sees it. Cons: I can't link siblings with different last names (or at least if there is a way, it isn't intuitive or easy to find). Pros: Amount of content that can be stored for each student. I like the daily count and the historical info too. Cons: Slow communication between tablets and server. Wish that new students populated faster than they do. We add new students, then there is a dupe once system catches up. Pros: Easy to use, clear interface, ability to easily save pictures and video. Cons: A bit laggy when opening the app. Would like to be able to send notes after my kidis checked in for the day, in case I think of something to tell the teacher after I get to work. Would be nice to have a monthly calendar function also, to see future events and menus for the whole month. Overall: Great detailed overview of kid's dat. Great communication tool. I LOVE this software. I can now keep track of what my child is doing at all times. Pros: I love this software because it gives me a live look at what my child is doing at all times. I love te pictures they send you as updates. Make my day every time. Overall: Monitoring my child's life. This is such a lifesaver and it should cost triple what it does. Cons: The software glitches way too often. It does not always send the information through to the parents the same day it is entered. I have been told parents receive pictures of their children on weekends when the picture was submitted to Tadpoles on Friday. Overall: We are really tackling the task of keeping the parents updated with how their children are doing throughout the day using this program. Pros: The ease of use for both families and the childcare providers. It is a great tool in allowing teachers to quickly capture, update and share the most important information about a child's day with families. Pros: Super Easy to Use. Love getting pictures during the day and the logged reports daily. Overall: Really nice software in the eyes of the parent/end user. Pros: I love that I am able to get photos/videos of my child throughout the day and that I am able to inform the center if my child will be absent, late, etc. Cons: I have used similar apps that allowed me to message with the center staff in real time, however, this app does not offer that. I'm unsure if that is center-specific or not. Pros: I enjoy seeing the pictures of my child, knowing what he ate and how much of it he ate. It is easy to use and I have experienced no difficulties with it in the past 19 months since I began using it. Cons: The portion where you can communicate with the teacher sometimes does not work on the app. Pros: I love Tadpoles. It is so easy to use and allows parents to stay up to date with everything happening with their children during the day. Cons: I would be nice to be able to leave a message for the school teachers during the day. Overall: Absolutely amazing and so much better than competitors we are working with. Pros: I loved the easy of this program. Even when I no longer use it I know for a fact it is the best one I have used and wish I could have at my new company. Cons: There was nothing I disliked about it, it was always easy to use. Pros: I love getting updates about my daughter while she's at school, and seeing what she's done throughout the day. Cons: Sometimes the pictures take a long time to load and I can't cycle through them. I end up switching to the email I received half the time to get to them faster. Pros: I like getting regular updates about what my child is doing. You can select getting an email or a notification. Cons: Some of the settings are not as easy to figure out. Cons: Wish the photos were available longer than 24 hours, but I understand the security reasons. Overall: Great product, very happy with it from a parents perspective. Pros: Loved getting photos and updates from our kids teachers. Cons: Seemed to be slow at times. But this isn't a deal breaker. Pros: Easy to use and compatible with Teaching Strategies, this is a huge feature for Head Start schools. Cons: Would love to be able to attach an objective to the photo that are sent to parents. There should also be a mobile app for it! Pros: Everything!This changes the game,when it comes to parental education,n early childhood.It is a way to let your parents know what is going on at school, in real time. We used to update parents by paper,but this is so much cooler.We can include lesson plans ,daily transitions and even special notes . Cons: I dont have any complaints.Tadpoles is a game changer. Pros: I love how we can add pictures and send daily reports. Cons: I really like it, I don't really have a negative. Pros: Seeing pictures posted and daily reports on what happens at school is awesome. I am an end user and do not know how inputting data is, but viewing it is made easy with the mobile apps. Cons: The only real downside that I can see on the user end is the Android app tends to crash or restart when opening it. Overall: Viewing updates on my child's progress at preschool is a breeze with the Tadpoles app. I like how simple the app is. Pros: I like the dashboard and how easy it is to see what is happening in our building. I also like how we can incorporate pictures. Provides a really good experience for parents. Cons: I wish there were a few more features with notes and historic information, such as notes, pictures and such from an administrator perspective. Overall: Parents really like it. Pros: I like the ability to see pictures/videos as soon as they are approved and sent out. Cons: I do not like that selecting a notification brings me to the home screen in the app instead of directly to the picture/note I clicked on. Keeps me close to my son and his teachers! Cons: I really have no major complaints about this software. Although it is simple it works very well in my phone. Every parent would love this! Pros: Can view your child's daily schedule, and social activities, and such, super cool! Cons: Is there a way, I could get updated though throughout the day? Comments: As a parent, I really enjoy the ease of use of the Tadpole software. I'm not a user, but receive notifications, emails, and media from the software and let me tell you, it is impressive. Mobile options, easy to understand UI when loaded on web, etc. The output from the software is also very organized and professional looking, thumbs up! Comments: Fantastic add on for our current childcare management system. Gives us real time staffing and enrollment with live reporting in 15 minute increments. Very intuitive! Great feedback from teachers, administrative staff and parents. Comments: Tadpoles provides our parents with a window into their child's world at school. I couldn't imagine running our Child Care without Tadpoles. Also, the Tadpoles team is always there, ready to help with any problems and listen to any suggestions. Comments: someone always answers the phone if we have a questions and the system is always adding new features!